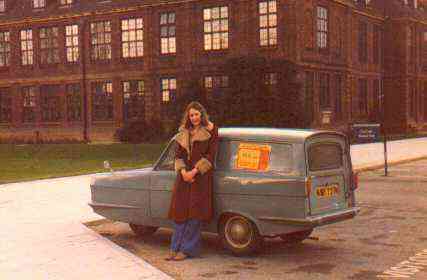 That's Dinah leaning on the good ol' van parked in the VISITORS ONLY area at the front of Hull University around 1977. The red and yellow sticker on the side proclaims the vehicle as being the "TeleScope Outside Broadcast van". In those days the unions television society didn't have cash for fancy gear. Driving down the motorway doing nearly 80mph in the van when the steering suddenly stopped working 'cos the front tyre had just fallen off!